Jeffrey Anvinson has worked as a performer, composer, arranger, conductor, educator, music engraver, music transcriber, recording artist and producer (both sides of the microphone), video producer, writer, music critic, and business owner. He has taught more than 24,000 individual music lessons (guitar, piano, and others) and 160 sections of classes on subjects such as applied guitar, classroom guitar, music theory, ear training, sight singing, guitar pedagogy, guitar literature, and creative music. He has experience teaching in many settings, including universities, community education, commercial	businesses, public schools, private	practice, and the internet. He has also been a music director and announcer in public radio, president and founding member of the Grand Forks Guitar Guild, and freelance music critic for the Grand Forks Herald. He has performed classical, jazz, pop, rock, blues, musical	theater, country, religious music, reggae, and bluegrass on radio, television, and other venues as a soloist and in numerous ensembles in the United States, China, and Canada. In the summer of 2009 he performed at Steinway Hall in New York City and Rock Hall at Temple University in Philadelphia with musicians from Brazil, South Korea, and the United States, in a series of concerts celebrating	the 80th birthday of Brazilian composer Ernst Mahle. He traveled to China in 2007 with violinist Eric Lawson on a performing and teaching tour at universities in Shanghai and Nanchang. Other venues include the Minot Integrity Jazz Festival, University of Minnesota (Minneapolis), busking in Winnipeg Canada, Frost Fire Theater in Walhalla, ND, the upper and lower peninsulas of Michigan, and in scores of concert halls, churches, restaurants, weddings, musicals, and other events in North Dakota and Minnesota. Anvinson has premiered compositions by many composers, including noted American composer Daniel Pinkham. 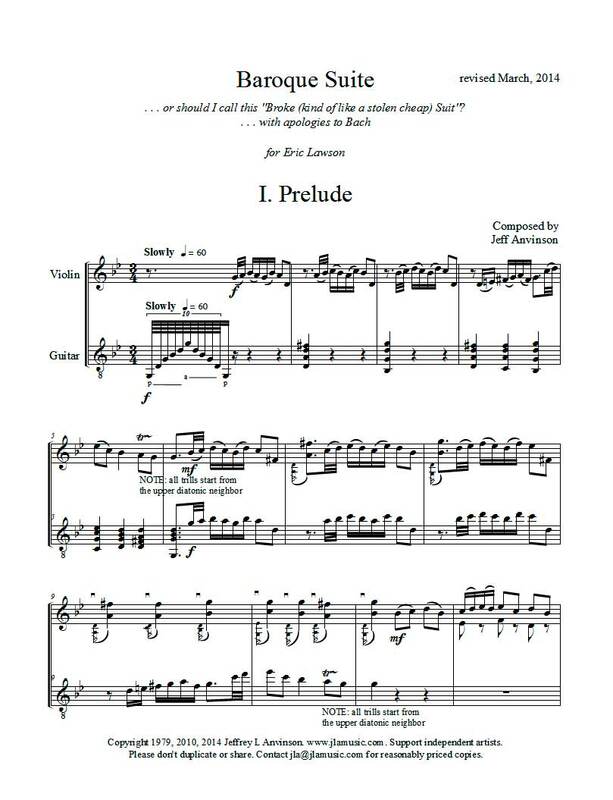 In June of 2015, preeminent Brazilian classical composer Ernst Mahle wrote a Sonatina for Guitar and Piano which bears a dedication to Anvinson. His compositions and arrangements in the genres of classical, pop, rock, jazz, and dance include works for chamber orchestra, wind ensemble, guitar ensemble, electronic media, and other instrumental combinations. 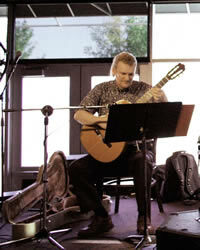 His music articles and reviews have been published in Soundboard (the official publication of the Guitar Foundation of America), The North Dakota Music Educator, The Grand Forks Herald, and online at Ezinearticles.com. He is the author of numerous music educational materials and other written works. He has created and produced educational videos for his YouTube channels, jlamusic and musicmannd1. His audio recordings can be found on iTunes, Amazon, CDBaby, at retail stores, and elsewhere. He holds a Master of Arts degree in music, a bachelor's degree in music education, and a Manager and Supervisory Development Certificate. He is a member of Pi Kappa Lambda, a music honor society. His awards include the Americanism Award, induction into the Phi Eta Sigma honor society, and being named "Artist of the Week" by the Grand Forks Herald. While teaching at the university level, he was named one of the "Faculty Stars" and nominated for a university-wide outstanding undergraduate teaching award. Having taken an interest in electronics while in grade school, he studied electronics for two years at the Area Vocational Technical Institute in East Grand Forks, MN, while attending high school in Oslo, MN. His former students hail from many places in the world - Norway, Japan, Sri Lanka, Brazil, on cruise ships on the Atlantic Ocean - even one who was in Antarctica - to locations throughout the	United States. The number of students Anvinson has taught probably number in excess of two-thousand. He has studied with a significant number of teachers, many with national and international reputations, including Pulitzer Prize and Grammy Award winners. He currently owns and operates JLA Music, a music company that provides lessons in guitar, piano, music theory, arranging, composition, music technology, and other music subjects. His website, www.emahle.com, distributes and promotes the guitar music of Brazilian composer Ernst Mahle. He started playing piano when he was six years old and guitar when he was fourteen. He learned many other instruments as well, including voice, though he now focuses on guitar and piano.